Commento of the Weeko. You didn’t know about my fine bilingual abilities, did you? Those of you who couldn't care less about pets will be delighted to hear that I am going to a big Farmer's Market (which probably doesn't need to be capitalized and I am kind of irking myself) with my friend the other June today, so there may ACTUALLY BE PHOTOS of something other than this kitten's every move. Yes, that is a Jan Karon book being used as a step for him to get in and out of the box. Sue me. This week's comment of the week is really more of a comment of the weeks, because I was out of town last weekend and didn't get to it. However, I awarded the oh-s0-coveted thing to the same person. I am sorry, but she was dang funny for a fortnight. What do you want from me? Facts are facts. Oh! And Suburban Correspondent? That isn't true! I do not try to make my hair straight! I use curl-enhancing shampoo, curl balm after, and let it dry naturally without combing because I read that Curly Girl book, and still I get the Prince Valiant look. Yes, I understand that I just burst into that tangent out of nowhere while you are all on the edge of your seat holding onto your lottery tickets to see if you won. Sorry. This week's and last week's award goes to Paula from New York, Dammit, who was funny about Earth Day and her dress size on her Amazon wish list. Go look on Special of the Week and you will see I had little choice but to award her both times. Tallulah has taken it upon herself to monitor Henry's every move without a camera. I think she worries the other cats are gonna kick Henry's teeny arse to the moon, something that is on all of our minds, actually. Except Henry's. When the other cats come around, Lula literally stands over the kitten and growls menacingly at the cats. In two days, she has gone from being a goofy, overgrown puppy to a concerned maternal figure. And yes, they are hanging in the bathroom. I do not know why. I'm glad Henry has one ally in this house of hisses, though. Previous Post Ask Henry and June. Hey, wasn’t that a dirty book by Anais Nin? Love, love, love the photos!!! It’s a good thing I don’t live in Greensboro, I just might be a catnapper. That little Henry is sooo dang cute. 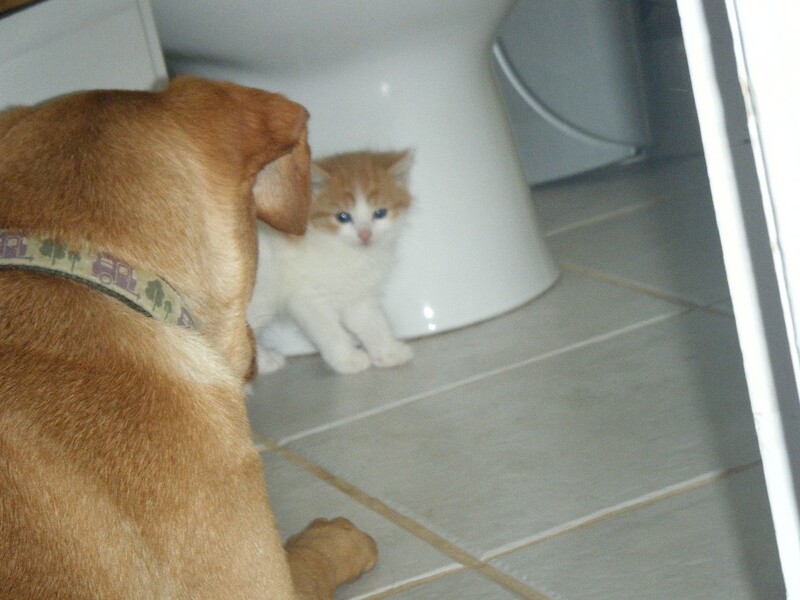 Maybe Tallulah has finally found her calling–a cat guard dog. Who would have know? 1. Your bathroom is so clean. I = impressed. Also? I = bad housekeeper. 2. I also love the coverlet/spread/whatev. Tres chic. And no pulls from cat claws? HOW? Oh, cute little baby kitten!!! He and Tallulah are so precious together! And Tallulah has a baby of her own now! Keep the pictures coming, they are so sweet. And everyone who is human loves kittens, even if it’s just to look at them. I’m loving the Tallulah-Henry combo – just adorable and they match! So nice for photos, dontcha know! My Polly would LOVE to have a kitty. She likes their leavings, for one things. She finds cats fascinating – always at a distance, of course. Apparently Emily has not checked on June in a few days because ohmygoshjunegotakitten!!! I love that kitten. There were some kittens at a yard sale last weekend and I held one for a slightly inappropriate amount of time. But check this out, it was a yard sale, right? You have to pay 50 cents for a board book. But a living, breathing kitten? Totally free. What on earth? I had a really bad cold this week, and I thought I’d checked your blog each night and I hadn’t. I blame the medication. Anyway, I finally stop hallucinating enough to actually use my computer and what do I get? An overload of cuteness! So freakin’ adorable! I can’t stop with exclamation points it’s so sweet! I wasn’t yelling. I know you were just trying to help this sad, sad hair situation. Maddox. See what I did there? You said an Angelina Jolie kid name, so I did too. I slay me. Hey – next time you yell at me, can’t you hyperlink my name? I need the traffic. And I really do apologize. Ever since I saw the difference in my daughter’s hair, I’ve been like one of those obnoxious people who has quit smoking and tries to make everyone else quit smoking too. It’s a bedspread. I wanna say from the T and J Maxx, there. I’ve been looking at that last picture with Tallulah and Henry on that wonderful fabric. What is that? A futon? A big pillow? A bedspread? Where did you get it? Purty! I’m sort of with Gladys on the hair thing. I switched last year to “mostly” doing the baking soda wash and apple cider vinegar rinse on my hair. I find I like the texture, bounce, no what the heck is the word they are always trying give me more of? Body? I think that is it. I have noticed a bonus of my hair being a titch lighter so I am not going to need near as many store-bought highlights next time around. Take a teaspoon or so of baking soda and mix it with a cup of warm water and pour it over your head and work it in all over your scalp and hair. Leave it for a minute and never, ever try to open your eyes during this process. That baking soda water stuff burns your eyes like nobody’s business. Rinse, rinse, and rinse some more. Then you can follow up with the apple cider vinegar rinse. The ACV helps to smooth the cuticle of the hair which in turn makes your hair shinier. You may want to check out Little House in the Suburbs blog. They have some really good info on washing with homemade soap rather than shampoo. Also, I read a great article on msn about going no-poo (their words, not mine) yesterday. Check them out, there’s really good information for changing the way we wash our heads. Now if only the rest of the world could get along like those two. I told you she thinks you brought Henry just for her. AWWWWWWW so cute. On the subject of your hair. Your not doing it right if you SHAMPOO. You are just supposed to rinse your hair in apple cider vinegar and use olive oil for a conditioner then toss and serve. Oh wait maybe that is my diet salad dressing book. Who knew Lula was such a mom. Too dang cute. Our puppies hang out in the bathroom too. I tell myself they are practicing good dental hygiene, like flossing or something. But I think they just like the coolness of the tiles on their wittle, little paws. I LOVE Henry!!!!! LOVE HIM LOVE HIM LOVE HIM!!!!!! Hey… Tallulah and Henry match. I really heart Henry. Did I mention that? How precious is Lula??? Guarding “her” new baby. Isn’t that sweet? I heart Lula. Farmer’s market? Will there be kittens there? How about pictures of whatever you might buy at the farmer’s market posed by Henry? How about pictures of the other June holding Henry? I’m ok with only kitten pics….! lol! Have fun at the FM! Tallulah has finally found her calling! Who knew? 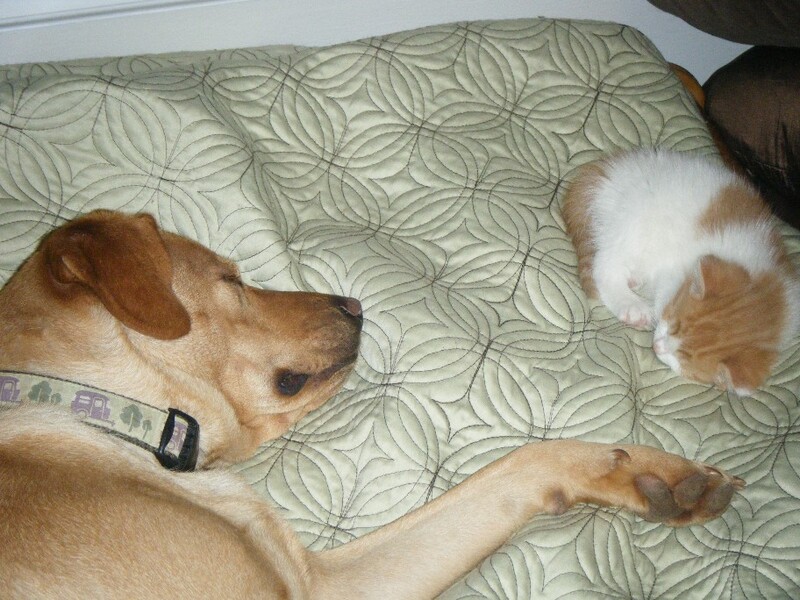 That has got to be the cutest photo of Lula and Henry sleeping. 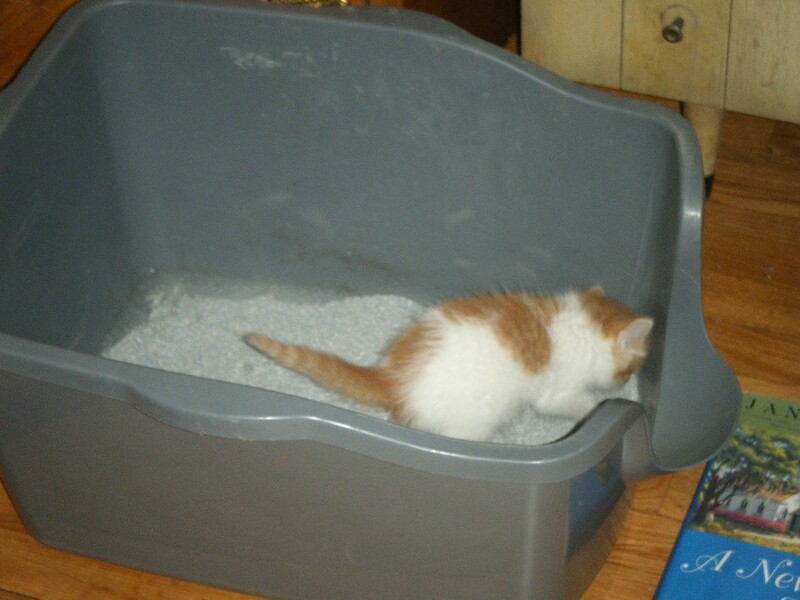 And I love the LARGE kitty litter box and the TINY kitten. You need to talk about something other than that the adorable kitten, for I cannot channel my inner comic in the face of all the cuteness.